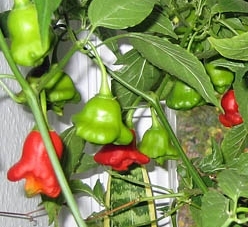 The Scotch Bonnet Chili is the Caribbean variety of the Habanero pepper. The name Scotch Bonnet describes the shape of the peppers, which are more broad than long, and clearly furrowed. The scotch bonnet is one of the hottest chilies in the world with a heat level between 100.000 and 300.000 Scovilles. The Scotch Bonnet chillies have a fantastic tropical fruity taste and develop an incredibly diverse flavour that reminds some people of apricots. They are an essential component of many dishes of the Caribbean cuisine, such as salsas with mangoes or papayas, rice dishes, grilled pork, or fish dishes.